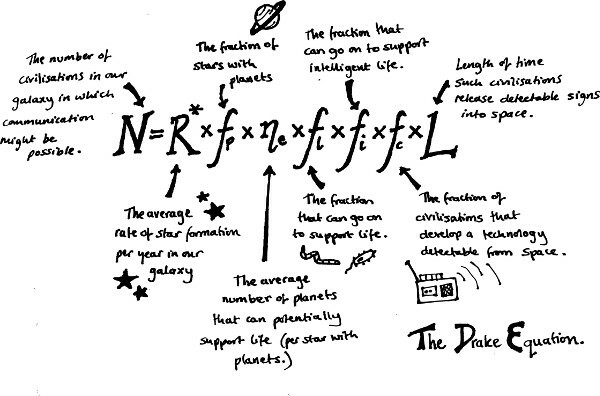 More aspects of the Drake Equation are becoming better known, but one variable remains up to speculation: The average age of a civilization. "Rather than asking how many civilisations may exist now, we ask 'Are we the only technological species that has ever arisen?'" said fellow researcher Woodruff Sullivan from the University of Washington. "This shifted focus eliminates the uncertainty of the civilisation lifetime question and allows us to address what we call the 'cosmic archaeological question' – how often in the history of the universe has life evolved to an advanced state?" Searches for extraterrestrial intelligence using large survey data often look for possible signatures of astroengineering. We propose searching for physically impossible effects caused by highly advanced technology by carrying out a search for disappearing galaxies and Milky Way stars. We select ~10 million objects from USNO-B1.0 with low proper motions (μ < 20 mas yr−1) imaged on the sky in two epochs. We search for objects not found at the expected positions in the Sloan Digital Sky Survey (SDSS) by visually examining images of ~290,000 USNO-B1.0 objects with no counterpart in the SDSS. We identify some spurious targets in the USNO-B1.0. We find one candidate of interest for follow-up photometry, although it is very uncertain. If the candidate eventually is found, it defines the probability of observing a disappearing-object event in the last decade to less than one in one million in the given samples. Nevertheless, because the complete USNO-B1.0 data set is 100 times larger than any of our samples, we propose an easily accessible citizen science project in search of USNO-B1.0 objects that have disappeared from the SDSS. Essentially, the (so named) Rio scale takes into account the following: What was the observation? (An intriguing radio signal? Flashing laser beams? An actual, physical encounter? ); How far away did it originate? ; How often did it occur? Those factors, lumped together, are multiplied by the report’s credibility—did it come from a credentialed university group, or some internet rando? We report radio SETI observations on a large number of known exoplanets and other nearby star systems using the Allen Telescope Array (ATA). Observations were made over about 19000 hr from 2009 May to 2015 December. This search focused on narrowband radio signals from a set totaling 9293 stars, including 2015 exoplanet stars and Kepler objects of interest and an additional 65 whose planets may be close to their habitable zones. The ATA observations were made using multiple synthesized beams and an anticoincidence filter to help identify terrestrial radio interference. Stars were observed over frequencies from 1 to 9 GHz in multiple bands that avoid strong terrestrial communication frequencies. Data were processed in near-real time for narrowband (0.7–100 Hz) continuous and pulsed signals with transmitter/receiver relative accelerations from −0.3 to 0.3 m s−2. A total of 1.9 × 108 unique signals requiring immediate follow-up were detected in observations covering more than 8 × 106 star-MHz. We detected no persistent signals from extraterrestrial technology exceeding our frequency-dependent sensitivity threshold of 180–310 × 10−26 W m−2. Please note the link to doi.org is 404 Not Found. A shame since I'd like to see the developments since July 2016. Extragalactic Lighthouses --"We Can Now Detect Directed Signals From the Depths of the Cosmos"
“In our paper, we propose a search strategy that will observe nearly 100 billion planets, allowing us to test our hypothesis that other similarly or more advanced civilizations with this same broadcast capability exist,” Lubin said. Assuming they're still using radio, rather than some unrealized technology beyond our capabilities. The first is the Enceladus Life Finder (ELF) project, backed by NASA, and then there's the Explorer of Enceladus and Titan (E2T) project, supported by both NASA and the European Space Agency. Another key ingredient in the attempt to quantum communicate with other intelligent forms of life in the universe is a mean to decrypt quantum messages. We should need a quantum key. The quantum key ensures the security of the communication and endow the receiver with the necessary tool to properly asses the content of the message. In the absence of the quantum key we may not be able to properly decipher a hypothetical quantum message ETI may communicate. The reserachers steered microbes into creating molecules never before seen in nature through a strategy known as 'directed evolution', which Arnold pioneered in the early 1990s. Just as farmers have long modified crops and livestock by breeding generations of organisms for the traits they want to appear, so too have scientists bred microbes to create the molecules they desire. To this, Osmanov has argued that the problem is that we are looking in the wrong places. Last year, he wrote a research paper in which he ventured that an alien super civilization – i.e. one that was consistent with a Level II Kardashev civilization – would likely use ring-like megastructures to harness the power of their stars. This is in contrast to the traditional concept of a "Dyson's Sphere", which would consist of a spherical shell. Furthermore, he argued that these Dyson Rings would likely be built around pulsars rather than stars, and offered estimates on their dimensions which were dependent on the rotational speed of the pulsar. According to Osmanov's latest study, titled "Are the Dyson rings around pulsars detectable? ", Osmanov extends the problem of spotting alien megastructures to the observational realm. For example, and illustrated by the diagram above, green vegetation absorbs almost all the red, green and blue (RGB) parts of the spectrum, but reflects infrared light. This sort of process has been used for decades by Earth observation satellites to track meteorological phenomena, measure the extent of forests and vegetation, track the expansion of population centers, and monitor the growth of deserts. Last year, one researcher tested this idea by doing exactly that. Rene Heller from the Max Planck Institute for Solar System Research in Germany created a simulated message from an alien civilization and released it on Twitter and Facebook for the world to decode. “On Tuesday, 26 April 2016, I submitted a fake SETI message to the social media Twitter and Facebook and called it the SETI Decrypt Challenge,” say Heller. Aliens, Comets or Crap? What’s Going On With The Wow! Signal? Here's the funny thing about the recent "debunking" of the Wow! Signal. Antonio Paris is a UFOlogist in addition to being a planetary scientist. One would think he'd be chomping at the bit to prove aliens. In this case, mainstream astronomers are taking his hypothesis to task. Chris Lintott and others on Twitter have published a list of their questions for Mr. Paris. It seems the world's been turned upside-down in this case. Funny in light of the many mainstream astronomers crying about the cause of KIC 8462852/Boyajian's Star's dimming not being an alien megastructure. Which brings me to something a friend told me on Facebook. (M)any of the assertions of astronomy do not meet the falsifiability criterion in its original strong form because astronomy frequently makes assertions about object too far away and too far back in time to be subject to the observation and experimentation that would make them falsifiable. (T)he assertions of astronomers are, at present, accepted because they are theoretically falsifiable, even though they are, in practical terms, not. Was the Legendary "Wow!" Signal Caused by a Comet, Rather Than ET? With the gravitational-lensing effect, a little power would go a long way towards transmitting data back to our solar system. “Around the nearest stars, a handheld laser pointer could do it,” says Hippke. The data rate would be high enough that sending pictures and video is possible, although at present it would still take four years to receive any data stream from as far away as Alpha Centauri. “The signals consisted of broadband quasi-periodic non-polarized pulses with very strong dispersion-like features,” Abel Mendez, a planetary astrobiologist at the University of Puerto Rico at Arecibo, said in an online advisory. Mendez is also director of the Planetary Habitability Laboratory. This is a newly active period from an unknown source that astronomers labelled FRB 121102. It’s a source of fast radio bursts (FRBs). We still don’t know much about FRBs. They were only first detected in 2001, and the first time we saw one—this one, in fact—repeat was in 2015. FRBs are exactly what they sound like: super fast, really powerful burst of radio signals. But we have no idea what causes them. Funny how Mary Beth Griggs says "[W]e have no idea what causes them" but insists they're not aliens. Why don't they get astronomers, or people who graduated high school, to write at Popular Science? In the new study, the authors reverse this concept and ask, “How would an alien observer see the Solar System?” They identified parts of the distant sky from where various planets in our Solar System could be seen to pass in front of the Sun – so-called ‘transit zones’ -- concluding that the terrestrial planets (Mercury, Venus, Earth, and Mars) are actually much more likely to be spotted than the more distant ‘Jovian’ planets (Jupiter, Saturn, Uranus, and Neptune), despite their much larger size. "If we could find a binary star system composed of a pulsar and a black hole, we would be able to study the space-time around the black hole by using the pulsar," Chen said.